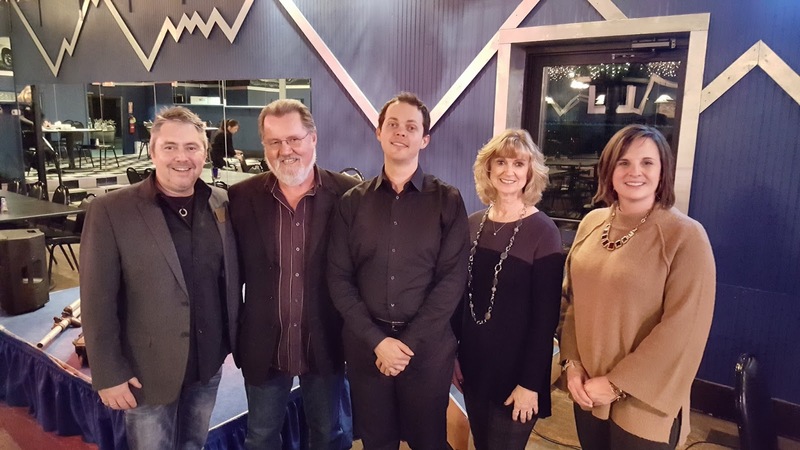 Chase Padgett after his performance at The Bistro Off Broadway with Ted and Diana Abney, owners of The Bistro Off Broadway, and Andrea Jordan, DCCA Executive Director and Keith Rawlins, DCCA Artistic Director. Darke County Center for the Arts recognizes Ted and Diana Abney, owners of The Bistro Off Broadway, for their sponsorship of DCCA's 2017-2018 Arts Count Season and for their continued support of the arts in Darke County. The show entitled “6 Guitars” stared musician, singer, actor Chase Padgett who channeled six different guitar players during his performance, each with a distinct voice and musical style. “This is a masterful tour de force performance that has earned numerous awards, rave reviews, and standing ovations all over the world, shared DCCA Executive Director, Andrea Jordan. "DCCA is grateful for the support of the Abney's and others in our community that make outstanding shows like this possible right here in Darke County." concluded Jordan. The Bistro Off Broadway and Ted & Diana Abney were also spotlight sponsors for the sold out Artists Series presentation of Rhonda Vincent & The Rage at Memorial Hall in January, as well as the sold out Coffee Hose Series presentation of Terrance Simien & the Zydeco Experience, also at The Bistro in October. For more information on DCCA and upcoming events, contact the DCCA office at 547-0908 or www.centerforarts.net.